Larkya Peak (6249m) is inside Manaslu conservation area which is less common to western tourist. Larkya Peak (6,416m) lies on the ridge north of Manaslu North and is visible from the northeast along the classic Manaslu Circuit trek. This pic is a bit tricky, but is not so difficult to climb technically. Along the route there are settlements offering the opportunity to discover the sites and natives with different culture, ancient monasteries, prayer flags and wheels dotted along are always a familiar sight throughout the trek.The route to the majestic Larkya peak leads through Gorkha in the northwest. The seasonable road goes to Aarukhat- Arkhet continues Sotikhola. Trekking path goes through the Jagat – Ghap – Lho – Samagau – Samdo. There are tea house / Guest house until Dharmasala. You need to sleep and eat at least two nights in Base camp by tented camp. Many climbers start climbing from Base camp, however you can make camp in High camp.Top of Larkya peak inspiring view of Kang Guru (6981m), Annapurna II (7937m), Himlung Himal (7126m) is at its best. To Climbing the Larkya, from the south, many climbers ascending Manaslu’s normal route have a clear view of Larkya Peak’s impressive granite southeast face. However, the approach to the southeast face is long and difficult. 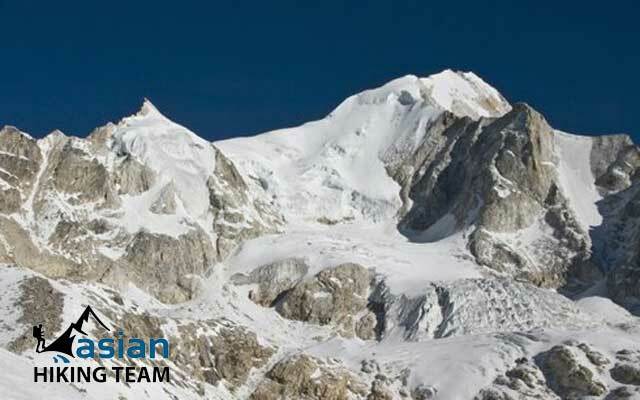 Asian hiking Team organizes Larkya peak climbing starting trekking from Aarkhet or Sotikhola to Larky Phedi or call Darmasala and heading to High camp and summit to Larkya Peak. After summit Larky peak either trekking crossing of Larky pass continues to Dharapani or returning trekking in the same way to Aarughat. Asian Hiking Team mention the itinerary crossing the Larke Pass end trek in Besi Sahar. Day 02: Sightseeing in Kathmandu and preparetion day for climbing permits and equipment, overnight at hotel (BB). Day 03: By Bus: Kathmandu to Aarughat Bazar continues to Aarkhet Bazar 5/6 hours drive and trek to Soti 1.20 hours, overnight at Lodge (B/L/D). Day 04: SotiKhola Trek to Machhekhola, overnight at Lodge (B/L/D). Day 05: Machhekhola Trek to Khorla Besi (1200m, 6h), overnight at Lodge (B/L/D). Day 06: Khorla Besi trek to Jagat (1300m, 6h), overnight at Lodge (B/L/D). Day 07: Jagat trek to Nyak Besi (1900m, 6h), overnight at Lodge (B/L/D). Day 08: Nyak Besi trek to Ghap (2400m, 5h), overnight at Lodge (B/L/D). Day 09: Ghap trek to Sho (2700m, 5h), overnight at Lodge (B/L/D). Day 10: Sho trek to Sama Gaun (3400m, 5h), overnight at Lodge (B/L/D). Day 11: Sama Gaun trek to Samdo (3800m, 4h), overnight at Lodge (B/L/D). Day 12: Acclimatization day in Samdo, explore around the valley and safe energy, overnight at Lodge (B/L/D). Day 13: Samdo trek to Larke Glacier (Dharamshala 4400m, 4h), overnight at tea house (B/L/D). Day 14: Dharmasala to Larky Base Camp 5,135m, 4-5 hours, overngiht tented camping (B/L/D). Day 15: Base Camp to High Camp 5,650m 2-3 hours, overnight at Camping (B/L/D). Day 16: Summit day for Larky Peak, return to Base camp 10-15 hours, Overnight tented camping (B/L/D). Day 17: Spare Day for climbing, if incase of weather or sickness or any couse (B/L/D). Day 18: Larke Glacier to Bhimtang (3800m, 8h), overnight at Lodge (B/L/D). Day 19: Bhimtang to Tilije (2300m, 7h), overnight at Lodge (B/L/D). Day 20: Tilije to Tal (1300m, 7h), overnight at Lodge (B/L/D). Day 21: Tal to Besisahar by Jeep 3-4 hours and drive to Kathmandu 4-5 hours or Pokhara 3-4 hours drive by tourist bus, transfer to hotel (B/L). Day 22: Departure to Airport as your own schedule (B). Sherpa's Summit Bonus or Tips.